Alumnus Kevin Willson (’01) headed to the Super Bowl for the third year in a row as a finalist in Doritos’ national commercial contest, “Crash the Super Bowl” and the 30-second spot he created aired during the Super Bowl pushing Willson, the film’s director, and his crew closer to winning $1 million from Doritos. Tuesday, Feb. 7, the USA Today & Facebook Ad Meter results were announced and Willson's video ranked number one winning himself and the crew $1 million. The 45-member film crew committed two months of time and energy into making the video, titled “Sling Baby,” working for free in hopes the commercial would make it as one of the five finalists in the contest. 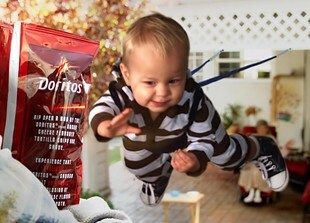 In early January, Doritos announced “Sling Baby” had been selected from more than 6,000 entries. “The chance to air in the biggest platform in the world is worth the risk of not making it,” said Willson, who is the only person to qualify for the contest in three separate years. Employing creativity and comedy, the commercial pairs two underdogs — a grandma in a wheelchair and a baby — to valiantly win back a bag of Doritos chips from a bully. “What I love about comedy commercials is telling a story in an incredibly concise way — you have to tell your story in 30 seconds and that’s a really fun challenge,” said Willson. For the commercial, Willson partnered with alumni Jeff Edwards (’00) and Daniel McNeely (’02), who both served as executive producers. The trio have been making films together since their freshmen year at Biola and employed two other Biola graduates — Bob Perkins (’00) as editor and Trevor Smith (’11) as 1st AC — as well as current Biola student David Reynosa for behind-the-scenes footage. Three years ago, Willson’s first contest entry, “Casket,” aired during the Super Bowl, gaining his crew second place. His entry “Birthday Wish” was one of the five finalists last year. Read more about “Sling Baby” and the making of the commercial. Watch Wilson interviewed by ABC7 News. Written by Jenna Bartlo, Media Relations Coordinator. Jenna can be reached at 562.777.4061 or jenna.l.bartlo@biola.edu. I hope 'Sling Baby' makes it to the Super Bowl. I miss my days in H.E.L.L. (Hart Even Lower Level) Biola was a great experience and I'm glad I got to help on this project. Way to go Kevin & crew! We truly need more, very talented, Christ-following artists in the film industry. I saw this during the superbowl! Looks like you guys won the contest! What a testament to the quality of a Biola education. Better update your article... They just won the million dollar prize!!! I'm so glad to hear that Biola, a Christ-Centered university, is making a difference in the film field. Congratulations Kevin and crew, you guys are a tremendous testimony for everyone ,specially for my son Aldo who is a freshman at Biola and pursuing Film as his major. Nice info :) greettings friend..
Way to go GUYS!!! The commercial is hilarious... my daughter Gia is at Biola and lives at HART what a great example you have set for not only Biola students but the whole CHRISTIAN and secular community, Hope to see more of your work in the future!!! !